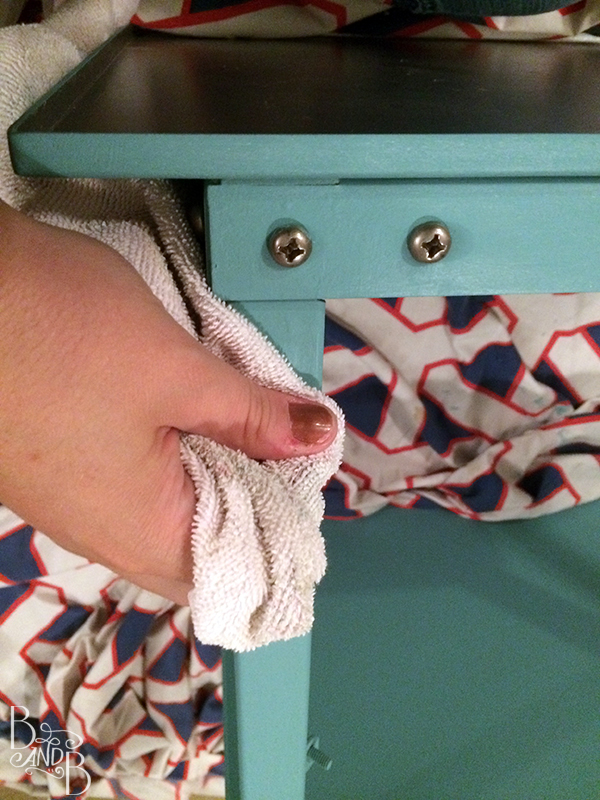 Remember that time I posted my foray into chalk paint? Well, obviously it’s long since been finished. This goodwill steal was destined to be the home of our printer. It’s handy wheels made it easy to roll the printer out on the rare occurrence that we’d actually use it (for printing….. wedding invitations?!?) while generally stowing it away. It also meant the printer wouldn’t steal valuable real estate on our desk surface, and it provided an additional storage space below. So here she is all dolled up and actually in use! If you recall the original state of the stand, it was a beige blah color and had equally blah (and yet oh-so-seventies) contact paper on the top. While I could have just painted the whole thing… I mean, CHEVRON. Honestly, could I do anything else? Of course not! It worked out that the contact paper and the paint were darn similar, if not exact same shades. It’s so close it’s as if it was meant to be! As for the storage space beneath, I initially thought a trendy basket – maybe one that’s sporting that dipped do? But ultimately I decided against it on account of the facgt that we somehow have the dustiest home on the planet. I figured decorative and also functional storage boxes would work well for organizing, while also being simple to wipe off. What do you think? So there you have it, a simple, neat, storage sollution for a printer stand. I dig it. I also dig THE REST OF THE DESK! ….that’s existed now for nearly a year and I’ve yet to post about it. OOPS. …kinda busy planning a wedding. My bad! DESK to be shared later this month!…. ?…!